You know you have really become a slave to the 21st century when you have the following conversation. Me: Ooh that sounds exotic. Friend: Yes, and the average temperature is 25 degrees, year round. Me: Know what you mean. I could live without winter ever again. So, Belize you say. Me: Still can’t quite place it. I’ll Google it in a moment. Friend: And the best thing is, it’s English speaking…what’s so funny? Me: I’ve just looked down at the floor and guess what is right by my feet? Me: Pretty much. 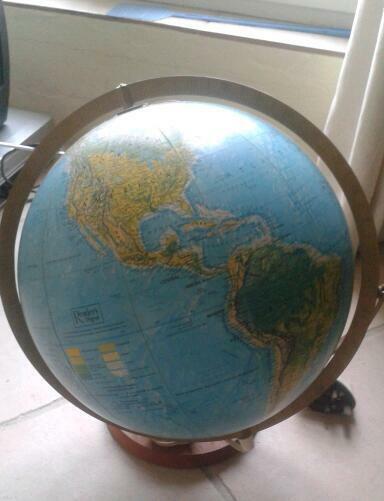 A globe. Friend: Yep. Why is it we can access stuff so much faster and yet seem to have less time? Me: Hmm. Belize. Let me know when you get there! Friend: Do you want snail mail, email, msg on FB or a tweet? Me: Forget snail mail…I may have moved…somewhere warmer.